Ask fellow campers about "Bull Creek Fish Camp" and nearby attractions. We spent 4 days here. We used our kayaks to explore the lake and channels. We also fished. We could launch our kayaks right from our site though there is a boat ramp if you need it. Sites are relatively level with concrete pads, picnic table and fire ring. The water is non-potable due to very high salt content. Sites are all full hook up with 20/30/50 amp service. We had heavy rain a couple of nights. Lots of water was standing but drained fairly quickly after rain stopped. Sites 1 and 13 looked to be the best to me. We were on site 12. 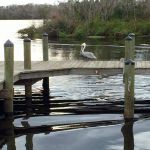 You can't just drive in to this campground without first calling Flagler county for a reservation. The campground is unattended. The restaurant had some unusual items on the menu. There was enough variety that we found something tempting. They are open from 6am to 8pm. A short distance from the campground is a nature preserve with raised boardwalks to get you out in nature. We camped at Bull Creek Fish Camp in a Travel Trailer. Bull Creek Camp restaurant, nearby nature preserve/boardwalk. 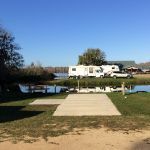 We stayed in a 42' motorhome on site 20 and were able to park and stay connected to our 20' trailer. Water is hard and water pressure variable, but tends to be low in the mornings. This is a beautiful camping area with amazing wildlife. Can launch your kayak from your campsite. We camped at Bull Creek Fish Camp in a Motorhome. Fish Camp restaurant on site has excellent food and service. Nearby Pit Stop Pizza will deliver to campsite. Stayed here with friends for 4 days. This is a county fish camp on a nice size lake with boat ramp, restaurant and small store. Roads are narrow but paved leading to camp. The campground is small with all full hook-up back-in sites with level concrete pads, picnic tables and fire rings. We saw lots of birds and took our kayak on the lake. There is limited tv, fair cell signal, the water pressure was low and the water is very hard. The campground is near farm land and a distance from beaches and grocery though a big dollar store is the closest. We really liked the restaurant as the food was good, the staff friendly and they have a happy hour for beer. This really is just a fish camp but we enjoyed our stay. We camped at Bull Creek Fish Camp in a Fifth Wheel. Sunsets are great. Lots of places within hour drive. Great catfish dinner. This is a small fishing camp. Fine for a 1-2 day stop, if just traveling. Full hookup is nice. Level, concrete pads. Sites are close together with no vegetation separating them. Bathhouse is just OK. Handicap shower was really the only truly decent one to use and it was not exactly clean. Camp is a good 10-15 min out of town and from beach. Restaurant is only good for breakfast (cheap!) and maybe a burger. Ranger is there for about 30 min a day. Just runs in and out. The lake is beautiful and the sunsets are great. We had river otters playing behind our site one night. Would not feel comfortable as a solo female at this park. Mainly due to lack of camp host and bar on grounds. 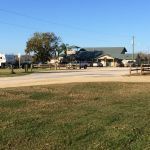 We camped at Bull Creek Fish Camp in a Travel Trailer. Are you affiliated with Bull Creek Fish Camp ?